Why are website heatmaps important? Website heatmaps offer an unparalleled aggregate view of how users interact with websites and apps, elegantly visualizing where users click, hover, and scroll. They can be combined with user segmentation to provide easy-to-digest comparisons between how different groups of users behave – how those coming from Facebook interact vs. those from organic search, for example – or to see how personalized or A/B variants of a website or app perform. Research has shown that the mouse movements of desktop users correlate highly with where they are paying attention. Clicks, meanwhile, mark the point where that attention becomes genuine interest or desire. Hover heatmaps thus indicate the on-page content that draws user attention, while click heatmaps indicate the content that piques their interest. Website heatmaps are harnessed by the world’s largest companies to better inform their digital experience optimization initiatives. The team at Tesco Mobile, for example, used a mixture of click, hover, and scroll reach heatmaps to investigate drop off in their checkout funnel. The changes they made based on these insights led to a 70% increase in conversion. 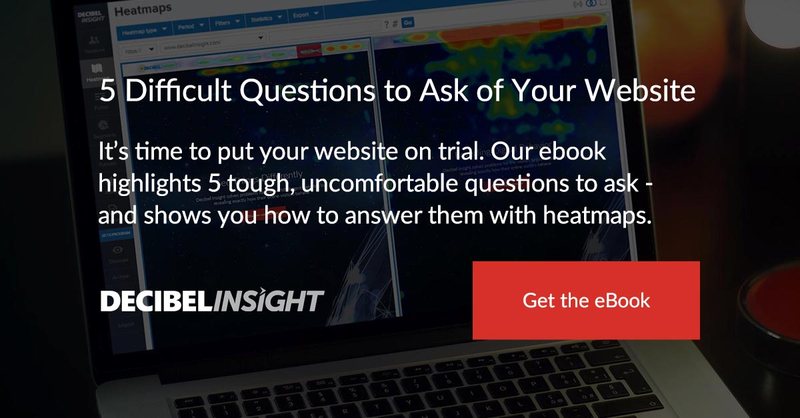 To learn more about website heatmaps – and to see how the world’s leading companies use them to optimize their websites and apps – download our ebook below. Or explore Decibel Insight's heatmaps further.